Rutgers University Press, 9780813513249, 159pp. There is an imaginary line, a green line made of rock called serpentine, that stretches along the eastern part of North America, from Georgia to Newfoundland. This line marks the ancient “geosuture”-the joining place of the North American and Eurasian continents during the geologic past. 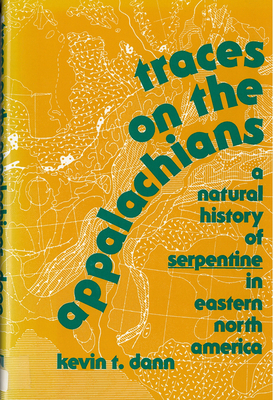 Kevin Dann’s Traces on the Appalachians is a natural and human history of serpentine. Geologists have pondered the serpentine for the story it tells of earth history. The gray-green serpentine outcroppings represent traces of the earth’s mantle, transported by sea-floor spreadings and thrust into the margins of the continent. They mark the collisions of tectonic plates and the birth of mountain chains. Botanists have puzzled over the strange plants that hopscotch their way along the dotted serpentine line, unable to live on more hospitable soil. To archaeologists, the artifacts carved from serpentine’s companion rock, soapstone or steatite, have yielded precious clues to the human past. Native Americans used soapstone for heating-stones, bowls, pipes, and oil lamps. Vikings gratefully recognized the soft stone in the New World and fashioned it into their own household objects. Today, we put it to use in pancake griddles, wood stoves, and chemistry lab sinks. Writing in the tradition of John McPhee, Kevin Dann brilliantly interweaves new and old science with tales of human endeavor, local history, and personal exploration. Any reader with a taste for natural history will want to join his search for serpentine. Kevin T. Dann, the author of Twenty-Five Walks in New Jersey, writes on the environment and local history.